P-10F a little better today at 50 yards, getting there. Cold, overcast, windy, 25F this morning, low 30's at the range, shot 90 rounds with the Kadet but was getting cold, so tried the P-10F again at 50 yards from a rest before packing up and heading home. This is an improvement from Wednesday. Will be better when I get my vision problem worked out and have some more ammo to play with. I'm skimping now. Hope to have a proper 5 shot, 1.5" group later this weekend or next week. I just couldn't quite get there this morning. I also have some 124 gr JHP ammo coming to try, for the first time ever (for me) as Atlanta Arms is behind on orders right now. Re: P-10F a little better today at 50 yards, getting there. I like shooting in the cold...when I dress for it. No one else at the range to bug me, either. I took the P-10F apart today and worked on removing the little bit of roughness I still have. I think it was on the disconnector angled ramp. I also smoothed the sides of the CGW trigger, but i couldn't find any real roughness there, to be honest. I don't like taking this gun apart. The 2.5 mm pins are too tight in the rear block and I launched my CGW slide retainer block part when I was putting it back together. The factory rolled tension pins are also a tiny bit short so they just barely catch the polymer frame at the holes. I will try some longer pins and trim them to fit the frame better. Trigger is a nearly perfect now. Pull weight is consistently around 3-3/4 lbs now. After the work this afternoon, there was still a tiny bit of roughness in the trigger pull so I removed the CGW striker and used some 2500 grit paper and polished the striker-to-trigger-bar surface some more. Put the gun back together and that was successful. I didn't shorten the contact area (similar to shortening the hooks on a 1911 sear) so I still have lots of trigger movement before the trigger bar slides off the striker face, but it is very smooth. Can't wait until Sunday morning to try it. I also trimmed some of the Sugru high spots off. I need to add some more Sugru to the face of the CGW trigger. I may be done for a while, other than changing to a proper Springer Precision red dot mount and adding Sugru to the trigger. The running commentary is also very helpful. You, sir, are doing wonders. I went back to the range early this morning to try the new trigger modifications out. Trigger is perfect now. It was cold and overcast again, but I needed to get some rounds in with the Kadet instead of the P-10F, so I limited my 10F time to just 10 rounds. I had some eyesight problems on the first 5, so I taped them up and tried 5 more. Here is the result in a very short video. My old Slaughter 75B mount had just enough play to show up at 50 yards. When I got home and put the slide in a vise and put a dial indicator on the sight, I could get 0.008" vertical movement, just enough to feel. I disassembled the sight and mount, added a 0.010" shim to the dovetail, tapped the Slaughter mount back in, tightened up all the screws. No movement now. Should be good to go, but Earl Keese is going to lend me a proper Springer mount to use until the Vortex/Burris plates are available. I KNEW I should have spent some more time adapting that old mount to the new gun! Got in a hurry. The mount started loosening after the string in the Friday video. The next 5 shots were low. I should have fixed it then, but I was too interested in fixing the trigger and missed what the holes were telling me--the sight had moved. Should be able to shoot a really good 50 yard group later this week, with the smooth trigger and the sight tightened up. Then, back to bullseye practice for a match in 2 weeks. I want to see you win a match with this gun, sir. I went to the range this morning in the rain and wind and shot 30 rounds and can confirm that the sight is rigid now. But my eyesight is unpredictable. I will have to return to the 50 yard rest quest later this week. Too miserable this morning. No vertical stringing now. I should have said for the Monday range visit that there was no vertical spread that the gun caused. I shot 4 five shot groups and struggled with vision on each one. The problem is that the dimmest setting was too dim and the next step was too bright for the overcast, windy, cool, damp conditions. But I got a good zero and the last 5 shot group was just under 2". I was really struggling with the dot size versus the aim point size. 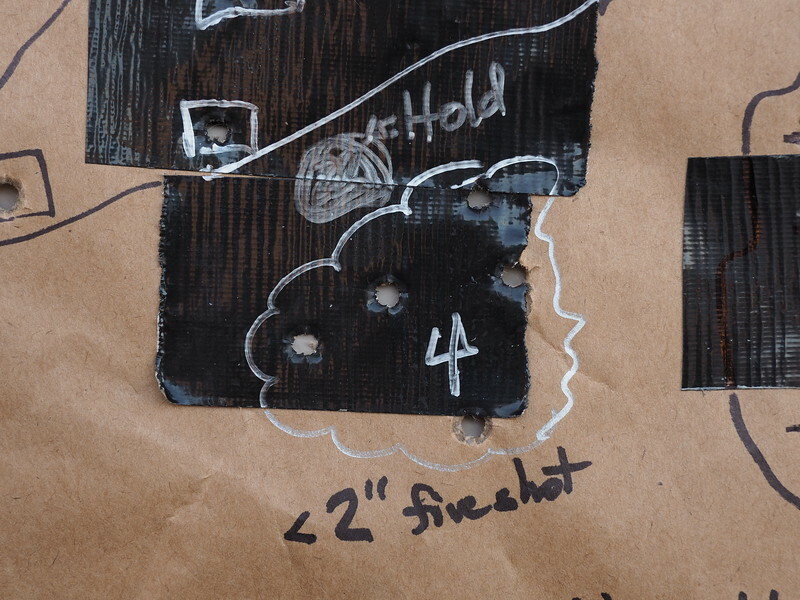 A 2" square piece of black duct tape works fine in sunny conditions at 50 yards but not on a dreary overcast day. My vision is becoming a problem, I think. Extending the aim point to 4x4 helped. Photo later. Sight and trigger pull are fixed now. And I received more .45 ammo, targets, and some some 9mm Fiocci JHP to try. And I got a call from Atlanta Arms saying the 115 jhp order could be filled this week afterall! So no more scrimping on ammo or paper B-8C targets! Match in 2 weeks. Had two bullseye shooters try the P-10F. They were amazed that a striker gun trigger could be that good. That discussion alone made the quick trip to the range in miserable conditions worthwhile. Plus I was able to confirm that the old sight mount is now good to go if the Springer Precision mount from Earl Keese doesn't fit the OR model P-10F slide. So another good day in full size, plastic, striker-fired 9mm gun land. 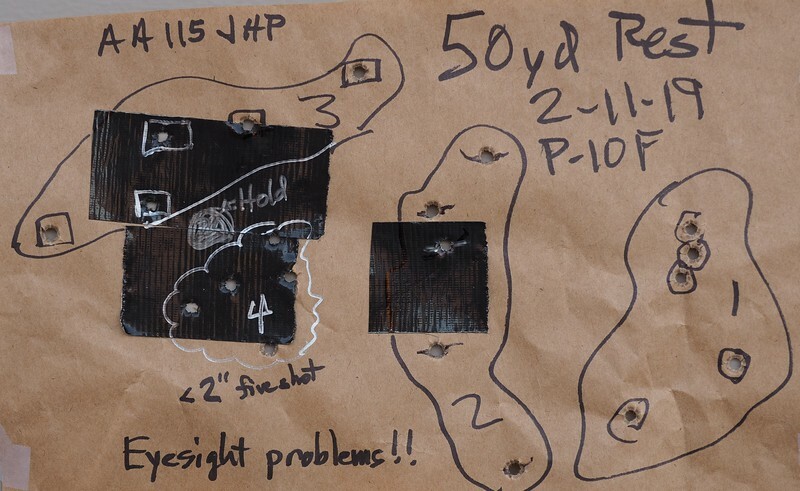 I couldn't set up a video camera at the range on Monday due to drizzle and other shooters, but I did save the target I shot while re-zeroing the gun after the shim job on the old mount. I numbered the 5 shot sequences 1-4. The aim point for 1 and 2 was the right small square, but, I had vision problems after 3 shots so the right group could have been good, but I mess it up. Moved the zero 8 clicks left and shot group 2. Then stopped, went out and made a big aim point and tried my best to hold as shown for 3 and 4. Group 3 was frustrating as the dot elongated and doubled and I couldn't tell where I was holding. But the elevation was a little off for 50 yards, so I lowered the zero 3 clicks and did my best for group 4, which is what all of them should have looked like as I was adjusting for a 50 yard zero about 1" below the aim point. I'm still working on the vision problems. Combination of progressive correction lenses, eye cover shape and color on the left eye, cataract surgery, dirty red dot lenses, compounded by lack of patience, cold weather, wind, I think. It isn't the gun. The gun is fine now. I will shoot closer to 1.5"...soon. Hey Joe , what is the Moa of your red dot ? I'm guessing a 2 ? Burris Fast Fire 3 with 3 moa dot for bullseye. The Microdot on the Kadet is 2 moa. I shot today in bright sunlight and was able to run the Burris dot at its lowest setting and had a much better day, vision-wise. I'm still analyzing the results. The Microdot is a first class tube type red dot sight. Very nice! My only red dot is a cheap Bushnell TRS-32 on the Trash Panda. I'm having trouble with consistency on the P-10F and I think it is the red dot, which came from the 9mm 75B slide. I recall having some problems with it on the 75B last year, too. I am going to swap the P-09 (good) sight and the P-10F sight (questionable) and try it again. It's like one or two good groups out of five right now, and I don't think it is the gun itself. If I have a bad sight, it will be the first Burris FF 3 that I've had any problems with. I may have run it at the limit of the adjustment when I first put the sight on the old mount and messed it up. Will know in a day or two. The Fiocci ammo is pretty good, I'm thinking, based on a few rounds shot on Tuesday. I'm not very proud of the shooting results in the video below, but maybe it will illustrate something useful to others. This is from Tuesday, with the P-10F and then 5 rounds from the P-10C at the end. After I finished with the 9mm's, I shot the Kadet. That video is in the Kadet forum. This is all 50 yard from a rest, with Fiocci 124 gr JHP and then AA 115 JHP. I had a group or two that was OK with each, but I still have what I think is a sight problem. Next step is to swap the P-09 and P-10F sights. Pretty sure the one on the P-09 is good.